EN Technologies Review 2019: Is EN Technologies a Good Hosting? 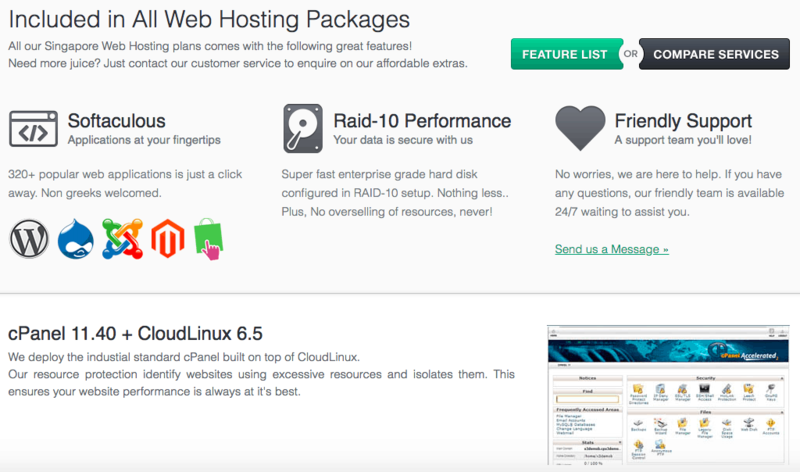 EN Technologies has been providing website hosting with RAID 10 configuration and CloudLinux since 2001. The plans are expensive, but the resources are generous. EN Technology owns its own data center, monitored 24/7 by on and off-site engineers, and located in Singapore. A great service in and of itself, EN Technologies also has a 99.9% uptime SLA for both its hardware and network. There are several performance enhancing and website acceleration features included as standard in the shared hosting plans. The plans run on cPanel and CloudLinux, which means they’re stable and secure, with a virtualization environment to isolate individual accounts from excessive traffic use and malicious attacks. The disks are configured in RAID 10 and you’ll get 1024 MB RAM, instead of the industry standard 256 MB. There’s even a free Cloudflare CDN included. The plans come with the beginner-friendly Softaculous, with more than 320 programs, and although it’s not on the website, there is a drag-and-drop website builder, SitePad. Also, after confirming with customer service, I can tell you there is support for PHP 5.6 to PHP 7. 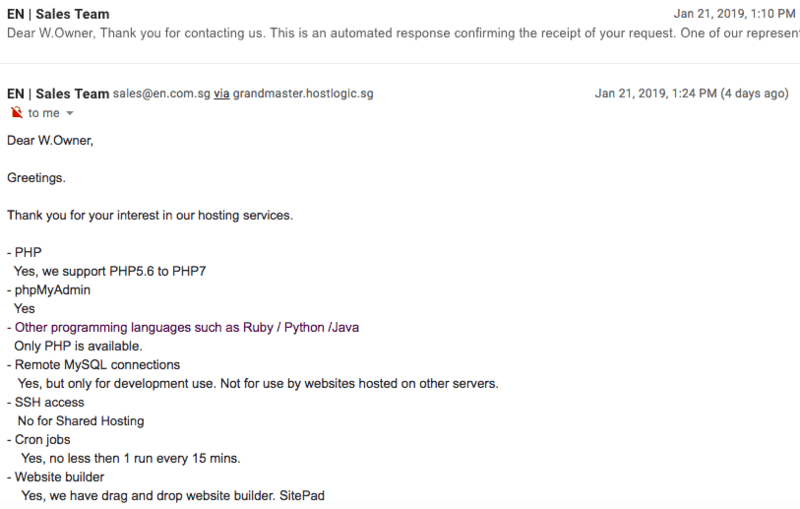 After emailing support, I learned that the features include phpMyAdmin, remote SQL connections for development use only, SSH access (not shared hosting plans), and Cron jobs that are more than 15 minutes apart. The only programming language supported is PHP, so you won’t find advanced scripting languages such as Ruby or Python. The plans are quite expensive, however you do get the benefit of a company that owns it own center, a solid uptime SLA, and decent resource allocations. All plans come with a free domain, though, you’ll still have the added cost of an SSL certificate, if required. The plans range from one month to three years, with a steep discount when you purchase a longer term upfront. There’s a 14-day money-back guarantee, which helps you get started without too much risk. For existing customers, you can contact support via live chat, email, and a ticket system 24/7, and pre-sales enquiries are either through a contact form on the website or by submitting an online ticket from 10:00 a.m. to 10:00 p.m. daily. Although it refers to a knowledge base on the main website, the link was broken when I visited the website. I contacted support using the website contact form and received a detailed response within about 30 minutes. The operator answered all of my questions (and I had a lot!) in English. EN Technologies is a solid company with enterprise-grade hardware including RAID 10 configuration, CloudLinux, and its own data center. The prices are high, but there are still plenty of features to enjoy, an uptime SLA, and good resource allocations. Wondering how EN Technologies stacks up against other Web Hosting companies? Enter any other Web Hosting company and we will give you a side-by-side comparison.